This is a very exciting promise, and truly would restore America to a position of greatness such as it has formerly held. Beyond the President’s undertaking, both the Democrats and Republicans seem to be racing each other currently to be first to come up with a $1 trillion transportation package – it seems there are exciting opportunities to rebuild America’s transportation infrastructure back to where it once was. America has already been three times great and the world leader in mass/public transportation. Today, it no longer leads in any transportation respect. But it now has an exciting chance to reclaim its leadership once more. In this first part of a multi part article, we look at how the US first lead the world, then successively fell behind, in three different types of transportation. In the second part, we look at how we consistently missed an opportunity the rest of the world has been responding to. In the third part, we reveal how the US now has a brilliant opportunity to become the world’s leader, yet again, with a totally new form of mass/public transportation. Next, we predict the incipient end of private car ownership, we consider the exciting future of high speed low cost transportation, and finally in part six, we indulge ourselves with a look at flying cars. The wagon trains opened up the west, but in slow motion. The United States is a country that was defined and in large part created by conquering the tyranny of distance – a problem unthought of in the lands our settlers came from. The early Mayflower pilgrims and other English settlers came from a country where nowhere in England was more than 300 miles from London. Those who came from Europe had similar or even shorter distances (remember that neither Germany nor Italy formed as nations until the late 1800s). Countries were essentially limited in size due to the difficulty in administering larger areas, and the lack of commonality between increasingly different people in further apart regions. Because, all the way through to the early 1800s, communication methods and transportation speeds were little changed from those of one and many thousands of years previously, countries were generally small and even the mighty empires foundered on the rock of distance. The enormous Roman Empire at its height had its outskirts generally within 500 – 1000 miles of Rome. More recently, similar distances applied to the Ottoman Empire and the Austro-Hungarian Empire at their peaks, and even to European Russia (ignoring Siberia) and China east of the vast Gobi desert. But, from the first settlements on the US east coast, 300 miles wouldn’t even get from Boston and New England to Washington or Philadelphia, and the other coast was an unthinkable 3,000 miles distant. Somehow, though, our forefathers had a spirit and a determination not to let distance impede them, and to form a nation, no matter what the mileages may have been. In the days of the Oregon and other trails (ie 1830s – 1860s) it would take between three and six months to cover not the entire coast to coast journey, but merely the 2,200 miles from a staging point probably in Missouri over to the end of the trails in California and Oregon. If you were traveling on a stage-coach, travel was faster, of course. When Butterfield’s Overland Mail Line opened in 1858, the 2,795 mile journey from San Francisco to St Louis took three weeks in good weather, longer in bad weather. Travel was 24/7 with only brief stops at way stations along the way. This is a breakneck speed compared to the wagon trains, but equates to an average speed of about 5.5 miles per hour – little more than a fast walk. It could cogently be argued that it was only the promise and incipient reality of faster transportation (and communication) that made it possible for ‘far away’ regions to viably countenance joining the union of states clustered originally around New England. 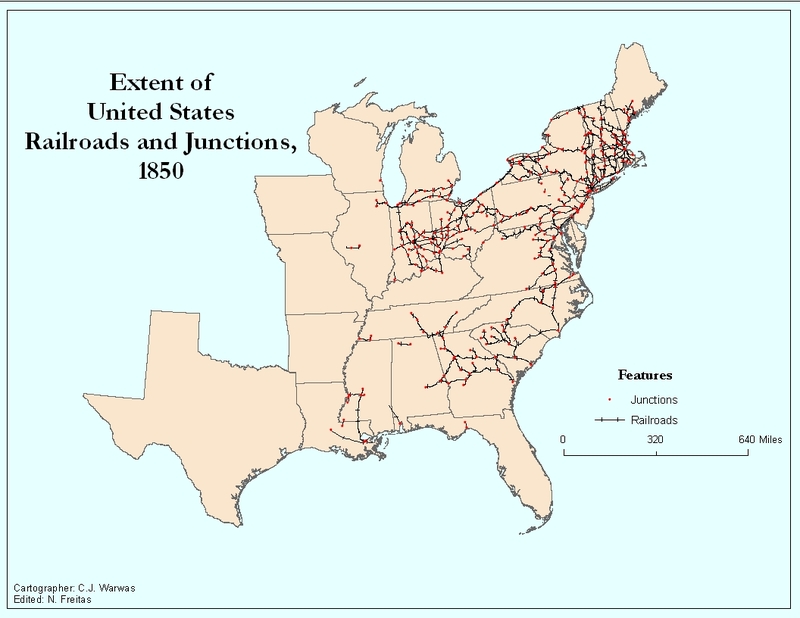 For example, a look at a railroad map of 1850 shows rail penetration that closely matches the states in the union at that time. This second rail map shows a fascinating contrast between the rail network in 1870 and 1890 – a period of extraordinary growth that was similarly matched by the addition of more states into the union. Population growth closely followed the rail lines. For example, in 1845 the Western & Atlantic Railroad built a rail line from Chattanooga, TN, and chose to end its line in a tiny town of 30 people, known then as Terminus, Georgia. That tiny town is still a transportation hub, even today, but is now known as Atlanta, and due to its transportation significance became the state capital in 1868. Here is an interesting page showing how long it took to travel out of New York in 1800, 1830, 1857, and 1930. As for the 3 – 6 months that it took to travel in a wagon, once the transcontinental railroad was first completed in 1869, the 3 – 6 months became 3 – 6 weeks and then quickly became 3 – 6 days, and by 1876, the coasts were only 3 – 4 days apart. In 1930, rail’s reign as the supreme method of transport was under attack by both road and air, although it would not be until after World War 2 that rail could be seen as clearly having fallen behind the other two methods of travel. The first experimental nonstop coast to coast passenger flight occurred in 1933, collapsing the three to four days of train travel time down to 20 hours. Most trans-continental flights continued to require four stops and an overnight, reducing to three stops in 1934, then one stop immediately after the war in 1946. By the early 1950s, the Douglas DC-6 allowed nonstop flights to become a commercial reality. Is it just a coincidence that this new era of transportation convenience, encouraging a collapse of regionalism and allowing the growth of more consistent national standards, coincided with the civil rights movement (generally considered to be 1954 – 1968) and major growth in federal government during the Johnson administration in particular? Efficient transportation not only helped our nation’s founding, it also shaped its development. So it is no surprise that we were successively excellent and the world leader in three different aspects of travel. America’s rail network bonded the country and its people. America’s first world transportation leadership was with its railroads. Although the UK was first to have a steam-powered railroad in 1825, the US issued a rail company charter in 1815, and had its first operational railroad (the Baltimore & Ohio line) in 1830. By 1833, the US claimed the crown for having the world’s longest railroad; – 136 miles between Charleston and Hamburg, SC, a claim it kept for most of the next 53 years until being bested by Canada. The US continued to be a world leader in rail transportation, including being the first country to operate an electrified line (in 1895 on the B & O). It built the world’s largest and most powerful steam locomotives, and the world’s most powerful diesel locos too, and operated the world’s longest (4.06 mile freight) trains until 2001 (with that title now being held by Australia). Grand Central Terminal in New York, originally built in 1871, is still the largest in the world in terms of platform capacity, with 44 platforms (although the Gare du Nord in Paris has plans to extend from 42 public platforms to 77). But, more recently? One word : Amtrak. It isn’t even a real word, and some people would suggest that by modern standards, it isn’t really a real railroad either. A notable exception would be Amtrak’s few hundred miles of track in the Northeast Corridor, in particular between New York and Washington DC, and to a lesser extent, between New York and Boston, with regular service and good ridership, and possibly even generating an operating profit. But even in that region, train journeys are not much faster than travel by private car (NYC-DC) or slightly longer (NYC-BOS) and most of the way travel well below true high-speed rail speeds. Sure, for many of us, there is benefit in a somewhat reliable travel time by train rather than the always uncertain travel time by car, and more benefit by being able to relax, work, eat/drink, and use a restroom on the train while traveling. But even in these ‘best case’ scenarios, Amtrak’s service is a long way short of fully optimized. Amtrak would like to upgrade its service in this corridor and replace it with a new 426 mile ‘true’ high speed rail route, that would give truly fast travel times. But back in 2011 estimated the cost to be in the order of $150 billion, and a 25 year timeframe for such improvements to be carried out. Funding has not been approved. Our passenger trains, once the pride of the nation, almost completely died out, to be semi-saved by Amtrak, an ‘impossible to succeed’ governmental creation that came into being in 1971. Even though Amtrak ridership has more than doubled since 2000 and continues to steadily move upwards, Amtrak has never been profitable, and as far as we can see, it is unlikely it ever will be, absent major changes to its structure and services. What happened to the forward-looking optimism of Pan Am? As a New Zealander, I necessarily must protest America’s anointing the Wright Brothers as being first to fly (NZer Richard Pearse has been accepted by the Guinness Book of Records and other authorities as predating them, and it seems a lot rests on what definition of ‘flying’ one chooses and how good a set of PR agents the fliers had at the time of their flight! ), but no-one can deny how the US has ‘owned’ and excelled at commercial aviation from its dawn immediately after World War One (in the 1920s) through until recent times. Whether it was the first flight across the Atlantic in 1927, developing the first modern commercial airplane (the Boeing 247 in 1933), the first pressurized plane (the Lockheed XC-35 in 1937), the astonishing DC-3 (still in commercial service even now), the first supersonic plane (the Bell XS-1 in 1947), the 707, the 747, or the plane that doomed the 747 by making twin jets acceptable for long distance travel (the 777), or the fastest plane in the world (the Lockheed SR-71), the excellence of the US aerospace industry has been proudly on display everywhere in the world. There was a time when the airlines that transported us were also excellent and similarly proud world leaders. Most notably Pan Am and its planes – or, as it styled them romantically, ‘clippers’, ranging from luxurious flying boats to 747s. The US also pioneered and lead the world with behind the scenes things such as autopilots for planes, computerized reservation systems and frequent flier programs. But the most unambiguous testament of all was simply by the sheer volume of people flying. The US aviation industry lead the world in terms of passenger journeys. Hello, Emirates and similar Gulf super-carriers, offering a quality of service that US airlines seem unable to match. Hello, Ryanair, Norwegian, and similar discount carriers offering airfare bargains – a phenomenon yet to even fully materialize in the US. In Europe, discount carriers can also be ‘nice’, but in the US, our traditional airlines feel that lower fares goes hand in hand with surliness. It has been farewell to Pan Am, Continental, TWA, Eastern, and every other major international US airline but for a mere three left standings – American, Delta and United. Hello, Asian markets and China in particular. By some measures, North America is now only the third largest aviation market. As for airplane development and manufacturing, the 747 was probably the high point of American dominance. One month after the 747’s first flight, also in 1969, the Concorde took to the skies. The inability/unwillingness of the US to come up with an SST, allowing the British/French and Russians to do so without any response was as astonishing as it was disappointing. It could cogently be argued that the unwillingness of the American aerospace companies to invest into SST is what caused a futuristic technology to stall, fall behind, and become successively less practical than subsonic type airplanes, which continued to receive hundreds of billions of dollars in steady ongoing investment. Well, there was one sort of high-speed travel we did briefly excel at during the last days of the 1960s and early 1970s. Also in 1969 we saw the climax of the space race, with the Apollo 11 moon landing, followed rapidly thereafter with the program’s collapse. No man has been on the moon since 1972. The brilliance of the 747 has also faded – both due to the even bigger and better A380, and due to the disappearance of large plane sales in general. Boeing’s market dominance, while allowing it to crowd out all other US commercial jet manufacturers, now sees it reduced down to about a 50% market share due to the rise of Airbus – a new European company which flew its first plane in 1972. Somewhere the wonder of our modern freeways became a nightmare. This shows the ‘MacArthur Maze’ in Oakland. 1908 was a momentous year. It saw the world’s first freeway – constructed in the US, the Long Island Motor Parkway. The same year also saw Henry Ford introduce the Model T to the US and – three years later, with production commencing in Canada and England – to the world. In the next 19 years he would build 15 million of them. So began America’s love affair with the automobile, a form of transport that quickly eclipsed the former mainstay – the train. Eight years after the introduction of the Model T, the amount of railroad route miles of track peaked (in 1916), and today – notwithstanding an enormous increase in population and freight – it struggles to be half the distance it was 100 years ago. Flash forward to 1956, and the United States again set an example to the world with the National Interstate and Defense Highways Act, which authorized the construction of 41,000 miles of interstate highways to criss-cross the nation. With an original authorization, in 1956 dollars, of $25 billion to fund the construction, it was to be the largest public works project in history. Actual costs, in 2017 dollar terms, are estimated at $525 billion. President Eisenhower enthusiastically pushed for the passage of this legislation, remembering traveling from coast to coast in an Army convoy in 1919 – a journey that took two months. After completing the highways, the same journey was reduced to five days. The American dream – nowhere more exemplified than in sprawling Los Angeles, a collection of spacious affluent suburbs tied together by a network of efficient freeways and made possible by universal car ownership – was at its zenith. Alas, as car ownership (and population) increased, the nation’s highways did not. The 41,000 miles of highway authorized in 1956 (at a time when the nation comprised 169 million people, 54 million automobiles and 10.6 million trucks) have grown to about 47,000 miles in 2016. But there are now almost twice as many people (330 million), more than twice as many cars (115 million) and a staggering thirteen times more trucks (140 million). As a result, 42% of our major urban highways are congested, costing the economy an estimated $101 billion in wasted time and fuel every year. Or highways aren’t just congested. They are also crumbling – quite literally. The Federal Highway Administration estimated, in 2013, a need for $170 billion a year in ongoing maintenance and investment, but only $90 billion a year is being spent. The average age of bridges on the nation’s highways is 42 years, and one in nine are rated as structurally deficient. Los Angeles – once exemplifying the American dream, now depicts the American nightmare, with hellish traffic much of most days. Whatever the solution is, more roads are clearly not the answer. The Boston ‘big dig’ – at its core, the simple addition of 8 miles of new freeway and some added lanes to existing freeway – took 25 years to complete and perhaps $22 billion. A current proposal to add 4.5 – 6 miles to the I-710 freeway in Los Angeles, allowing it to connect with the I-210 freeway, might cost $6 billion (or possibly considerably more). The cost-benefit equation for urban freeways has become impossible to justify. We desperately need a new wave of transportation improvements – for our trains, our planes, and our automobiles. But what? Please now continue on to the second part of this series, which looks not at any solutions, but at a missed opportunity to create a solution over the last three to five decades. Don’t worry, though – in part three, we tell you why that missed opportunity might prove to be a good thing, while in part four we wonder if the future transportation Utopia some people outlook will really be as amazing as hoped for. Thanks for the history lesson David. Very insightful and well written I might add! Can’t wait to read parts 2 and 3. Surely we have the creative minds to invent the next wave of transport.